Fermionic 87SrSr has a nuclear spin of I=9/2, higher than any other element with similar electronic structure. This large nuclear spin has many applications in quantum simulation and computation, for which preparation and detection of the spin state are requirements. 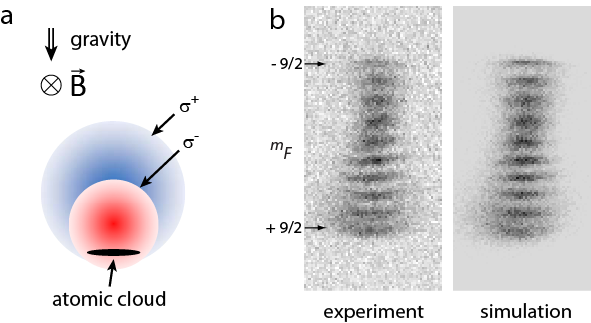 For an ultracold 87Sr cloud, we show two complementary methods to characterize the spin-state mixture: optical Stern-Gerlach (OSG) state separation and state-selective absorption imaging. We use these methods to optimize the preparation of a variety of spin-state mixtures by optical pumping and to measure an upper bound of the 87Sr spin relaxation rate. Figure 1: Optical Stern-Gerlach state separation. a) Two sigma-polarized laser beams create mF-state dependent dipole forces on a cloud of 87Sr atoms. b) After time-of-flight expansion the ten mF states are spatially separated. Figure 2: Simulation of optical Stern-Gerlach state separation. Low mF state atoms are attracted by the red detuned OSG beam, whereas high mF state atoms are expelled by the blue detuned OSG beam. The camera direction initially points along the OSG beam direction. At the end of the animation, the camera direction is rotated by 45 degrees to correspond to the camera direction used in the experiment.